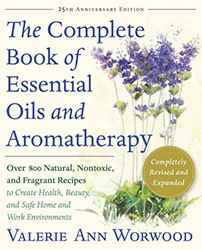 The 25th Anniversary Edition of The Complete Book of Essential Oils and Aromatherapy is now available on Amazon. The original 1991 edition of Valerie Ann Worwood's The Complete Book of Essential Oils and Aromatherapy was the first book I purchased pertaining to essential oils or aromatherapy. I am grateful to Valerie Ann Worwood as the original 1991 edition helped me begin to effectively incorporate aromatherapy into my lifestyle. This, in turn, lead to my growing personal and professional interest in the field of aromatherapy. It is now 25 years since the publication of that original edition, and I'm feeling nostalgic and am excited that Valerie Ann Worwood has significantly updated it to now include expanded content, some safety information, 125 essential oil profiles and 200 additional recipes. Even if you already own and love the original edition of the book, you may find it worth purchasing a copy of the new 25th edition as much of the content has been significantly updated. For comparison, the new 25th Anniversary Edition of The Complete Book of Essential Oils and Aromatherapy is approximately 250 pages longer than the original, and the book page width is about 1" wider. It's quite a hefty paperback. I love Valerie Ann Worwood's knowledgeable yet friendly and easy-to-understand writing style. I also like that she integrates essential oil and aromatherapy suggestions with other complementary suggestions relevant to each of the topics that she covers. I found this approach especially helpful when first reading her original version of this publication, and I continue to find this approach to be valuable. Below are a few of the areas the book covers and my comments about them. The new 25th Anniversary Edition of The Complete Book of Essential Oils and Aromatherapy now includes a Safety Information chapter. However, the Safety Information chapter is only 3 pages long, and it appears as the very last chapter of the book. Using essential oils shouldn't be something any of us should be fearful of, but essential oil safety is important. So, the chapter appearing as the last chapter of the book weirds me out a bit. However, Valerie Ann Worwood does integrate relevant safety information into each of the covered topics throughout the book, and each of the 125 essential oil profiles contains a "Precautionary Advice" section with safety and contraindication information. The safety information presented within the book is very helpful, but it should not be considered complete. For example, the Cooking with Essential Oils chapter is a wonderful opportunity to share practical and safe information on the subject, but I do wish that the opportunity was taken to ensure that readers fully understand some key basics regarding the differences between essential oils used sparingly for culinary use and ingestion. More safety information would be prudent out of care and concern for readers who sometimes may draw drastic and unsafe conclusions. The importance of carrier oil selection and the properties of carrier oils are sometimes overlooked within aromatherapy guides. I am pleased that this edition contains 37 carrier oil profiles. Although each is very brief and averages about 1/4 page, it's nice that they are included for convenience. I wish the "Contains" section include the specific fatty acids typically present in the carrier. Worwood includes a small yet helpful Hydrolat (Hydrosol) section that introduces what hydrosols are and the importance of careful sourcing. Included are 26 very brief hydrosol profiles. Within the Fragrant Way to Beauty chapter, Worwood includes 3 helpful hydrosol tables: Hydrolats for Facial Skin Care, Hydrolats and Their Uses in Skin Care and Skin Conditions. Essential oil chemistry is addressed within the 3-page Appendix entitled The Chemistry of Essential Oils. It provides a nice, easy-to-understand introduction to essential oil chemistry and includes a table covering the properties for each of the functional groups. This table is pretty handy and few books do offer a general table of functional group properties. However, I'm not spotting any areas of the book that cover essential oil constituents or what functional groups they belong to. The essential oil profiles section doesn't list them either. Therefore, the reader can't easily identify how the functional groups (labeled as phytochemical groups) apply to particular essential oils or their constituents without utilizing other resources. The 25th Anniversary Edition of The Complete Book of Essential Oils and Aromatherapy does lack elaboration in some areas. Despite the word "complete" in its title, it's just not possible for any aromatherapy or essential oil book to truly be complete. Having said that, the 25th Anniversary Edition of The Complete Book of Essential Oils and Aromatherapy is indeed dramatically expanded, and it is a pleasure to read and learn from. I am confident that it will prove to be of significant benefit to many beginning and intermediate aromatherapy students and essential oil enthusiasts. Valerie Ann Worwood is a consultant clinical aromatherapist with a doctorate in complementary medicine, and the author of eight books. She has been Chairperson and Chair of Research for the International Federation of Aromatherapists, and as well as her involvement in essential oil research, she has acted as a consultant and expert on the clinical use of essential oils internationally.